Salmson Radial "Canton Unne" System? This isn't a very well prepared section, but if I don't write it now I might not get around to it. Again lots of this is from memory, so bear with me. The Salmson 7 cylinder radial featured previously has a brass label stating patent for a "Canton Unne" system. I remember spending ages going through books and old engineers hand written notes to try and see or understand this application. I also remember that it was really difficult to picture the following without accurately drawing it out. The small amount of information always stated a reason but never how it was achieved. On the radial engine, there is one Master conrod attached to the single crankpin. 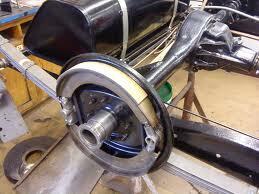 The remainig six rods are attached to the outer housing of the master rod big end. The attachment is similar to a small end and gudgeon pin arrangement. As the crank rotates the master rod centre point is the centre of the journal, however the centre pivots of the remaining rods are through the housing (circumference) of the master rod. If you plot the path of these and compare with the crankpin centre path you will see a different form during one rotation. I believe that the "Canton Unne" system was to allow a form of gear indexing to compensate for this. I can see the principle but the operation of a suitable arrangement is very difficult to visualise. For me it is just too far for my minds eye to grasp, I could try and labouriously draw each sequence and design in order to visualise it, but it is more likely that it is beyond me. The forces of this increased rotating mass (ie compensating sun and planet gears or similar)would also become an issue I would expect. It seems the design was not used although the recognition plate still proudly states that it has been in existence. I have never seen a drawing for this system, perhaps someone has, it would be good to say "Ah thats how they did it!" Lagonda V12 and Engine Design. Quite often I am asked, " How do I know what goes where?" I realise that the question is not always so sweeping and that of course it should be my job to know. However when an engine that is slightly different from the norm or is a little more complex arrives totally in bits with some items missing and often some items that are nothing to do with the engine, it can be a bit challenging. I do have something in my favour though. That is, many of the original designers travelled or influenced through many of the prestigious leading companies. W O Bentley, Tressiliyan? (excuse spelling), Rowledge, Henry, Miller, Bugatti and of course Henry Royce are to name but a few. Each of these often have their distinct areas or distinct methods that have been copied and reflected through the engines of the period that I specialise in. 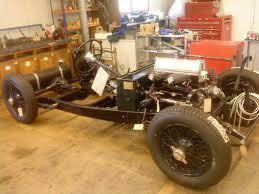 Below is a Lagonda V12 engine that I rebuilt many years ago, it is said to be a prototype or pre production engine. As usual it arrived in bits, but there before me is the design of W.O Bentley and perhaps a little Tressilyan valve design etc.And as so often all very elegant. Just like a crossword author becomes perhaps predictable (so I am told), then many of my decisions are made for me! First of all I must apologise as the following article is from memory, there may be some slight inaccuracies but most of the content is, I think, correct. During the Second World War, there was a particular little aeroplane that became quite the hero of the people in and around the Vichy France area. Because of the politics and tensions, resistance against the German forces and associates must have been a terrible struggle. The tenuous situation was supported by the brave occupants of a Caudron Luciolle biplane of the late 1920 period. She had been pressed into action in a new lease of life, equally as important as her record of training many of France's most recognized "pilotes". It is known that this little aircraft had been brought down by small arms fire on more than one occasion, finally languishing in forgotten disarray until the early 1970's. The sad decaying hulk became the subject of a full restoration, her period beauty and charm coming to life, the wonderful delicate "scalloped" trailing edged wings spread wide once again. The engine however, was replaced with a similar but serviceable item. During the early 1990's the aircraft was bought by an ex Mirage pilot from France, included with the aircraft was a box of the completely dismantled and neglected original engine. In the late 1990's I was introduced to the owner who asked the possibility of rebuilding the engine to a running but non flying standard. To rebuild an historic aero engine would be a great privilege, however to build this engine with so much history would be quite an honour. Finally the engine is or was, I understand, on public display in Toulouse. The aircraft has been used in publicity events, recognising it's contribution to the history of France. The last few weeks have been very busy, mostly with finishing projects and trying to meet deadlines........"deadlines", what a horrible word to a restorer! The other side of an ending project is that "hunger" of another project to keep the work coming and and of course the finances afloat! In amongst all of this I had an incredible chance meeting that I was amazed at, but also became the point of real disappointment. My one and only, "star" follower by chance travelled to Bassett Down Balancing and very cleverly put two and two together on seeing my bike with Historic Engine Co stickers on at the same premises. "Quaffmeister" came along to me and introduced himself, well you could have knocked me down, what a coincidence! The trouble is, we had the briefest meeting as I was just meeting a new customer and sorting out lengthy details. Having been delayed in my trip to meet the customer I had been 20 min late and so already felt quite awkward at keeping him waiting (he had travelled 80 miles and had been on time!). I wanted to meet and chat to the quaffmeister and had suggested that I would be finishing my meeting very soon, famous last words! Sadly I missed my chance. I then dropped my computer and from there all organisation and communication went out of the window. After all of this I deeply regret that I seemingly "stood up" the Quaffmeister, something that is not at all in my nature. I am really sorry for the situation. Quaffmeister, I am genuinely sorry for all of this and hope to have the opportunity to make a fresh meeting some day. If you hav'nt already, please check out his cool British Ironworks site for a very readable and inspiring blogspot. Smart British Ironworks Logo on my w/shop front window. And on my bench, thanks Quaifemeister! Thank you for the stickers. For the first time in over 45 years this Aston Martin is on its wheels on the ground, ready to roll. I have been working on the rebuild of this car for about the past two years. 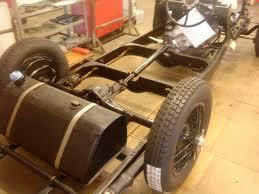 It arrived as a dismantled collection of lightly decayed parts and has been a full size jigsaw puzzle/ Airfix kit! 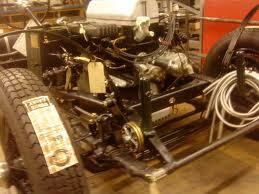 Right from the outset the car has been assembled on waist high trestles. I was not expecting the very low stance that faced me when I dropped it on to its wheels last week. 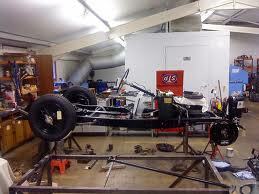 The chassis is underslung, ie below the rear axle, hence the Kart like height! This has been a great project and helped by the fact that the owner has been such a brilliant customer. Before I can start the 500 car I have to finish this 1962 C15T 250cc trials bike. I bought this project last winter. It is not quite standard, as can be seen by the tank but it will still hopefully build up into a nice bike. The engine is almost ready to fit. Not too long now to finish. May be just in time for the new year mud. The C15 and 500 car are my own projects so they have to fit in around the customer jobs. I also had a visit from a Ural outfit (my wife really wants one of these for herself). I really like the rugged timeless nature of this bike. 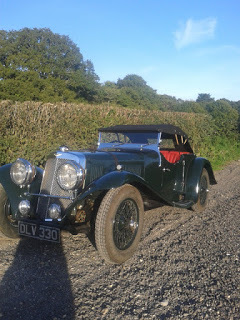 This chap once had a bearing instantly fail in the gearbox and lock up at 50mph...Scary. We do take the unlikely event of a gearbox lock up very lightly, but it doesn't bear thinking about on a solo at higher speeds. I mostly ride with two fingers on the clutch, just in case of engine seizure, of course that is no use in a gearbox failure. You just can't resist this stage, when you have a collection of bits you just have to do this! Now for the sitting in stage. New Project! 500cc Racing Car. Over twenty years ago a workmate and friend pulled up outside work and called me to come and look at his new project. The 500cc racing car that was sitting on his trailer was just perfect, I really envied his find. In the beginning of this year that same friend remembered my appreciation of his little car. He went to the trouble of tracking me down, even though I had now moved 130miles away and had shamefully lost touch with so many of that group. I couldn't believe that he was ringing to see if I would like his car as I had asked for first refusal all of those years previously......... The answer was an immediate yes! Very little had changed, mostly in similar condition to the last time I saw it ,but with an addition of a few more boxes of bits and some more wheels. The car's history is unclear, although it is said to be similar to a design by J Walker in the mid 60's. The old photos are thought to have been taken in 65 to '67 and we think this is in the Malvern area. There are no photos of the body although the JW4 Specials were very attractive. The engine bay has been altered to accept a four cylinder 600 engine and the wheels and tyres would be more suitable for that modification. It is my intention to bring it back to a very similar appearance to the car in the photos although I may build it with a speedway Jawa engine to begin with.... cost is a limitation and I have a suitable, although slightly out of period, Jawa. Sorry for the lack of posts recently, I'm afraid I dropped my PC!